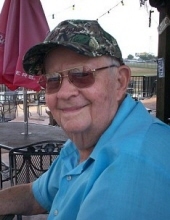 Joseph Edwin “Joe” Dossett was born November 29, 1928 in Hillsboro, Texas and passed away July 12, 2018 in Bryan, Texas. He was the son of Arthur Malcolm (1884-1944) and Daisie Leggett (1893 - 1981) Dossett. He had served his country in the U.S. Army during the Korean War. Joe spent his working days with the U.S. Department of Agriculture, assigned to several towns throughout Texas. He married Joyce Burdette (1928 - 2008) in Dublin, Texas. They moved to Madisonville in 1959, and called it home until each of their passings. He loved Madisonville and turned down more than one promotion rather than move away. Both of his sons graduated from Madisonville High School. Joe graduated from Hillsboro High School and enjoyed telling tales of roaming the streets of Hillsboro with the likes of the late Doctor Red Duke and the late Texas politician, Bob Bullock. He attended Texas Tech and was an avid Red Raider fam. Joe had a passion for hunting, working in his yard and Red Raider football. Joe was preceded in death by both of his parents; wife, Joyce Dossett; brothers, Malcolm and A.J. Dossett and sister, Grace Vincent. Surviving relatives include sons & daughters-in-law, Gary & Paula Dossett of Conroe and Edwin & Gloria Dossett of Miami, FL; grandchildren, Denna Dossett Mathieson, Jack Edwin Dossett and Elena Dossett Flores and great grandchildren, Andrew, Brandon & Emily Mathieson. A funeral service for Joe will be held Sunday, July 15, 2018 at 3 P.M. at the Madisonville Funeral Home in Madisonville. A brief visitation will take place from 1:30 P.M. to 3 P.M. before the funeral. A graveside service will be held 10 A.M., Monday, July 16th at Ridge Park Cemetery in Hillsboro, Texas. To send flowers or a remembrance gift to the family of Joseph Edwin "Joe" Dossett, please visit our Tribute Store. "Email Address" would like to share the life celebration of Joseph Edwin "Joe" Dossett. Click on the "link" to go to share a favorite memory or leave a condolence message for the family.